In 1930s Australia, Molly Craig, a young aboriginal girl, led her younger sister and cousin in an escape from a government camp where they were being trained as domestic workers to be integrated into white society. Led by Molly, the girls embark on a dangerous journey, eluding the authorities for over 1,500 miles as they follow the rabbit-proof fence that bisects the continent and will lead them home. Opening weekend $88,352 on 9 screens. Rated PG for emotional thematic material. 2002’s Rabbit-Proof Fence provides a rare animal: a flick that follows the “triumph of the human spirit” theme but avoids the usual sentimental pitfalls. Set in Western Australia during 1931, a preface tells us that the Aborigines Act runs the lives of the native people “in every detail”. A.O. Neville (Kenneth Branagh) acts as Chief Protector of the Aborigines, which makes him the legal guardian of every Aborigine in Western Australia. This also means he can remove “half-caste” children from homes; half-caste people have one Aborigine parent and one white parent. We meet 14-year-old Molly (Everlyn Sampi), who also acts as narrator. She hangs out with her sister Daisy (Tianna Sansbury) and her cousin Gracie (Laura Monaghan). Molly’s dad is part of the “Jigalong mob” who works on a 1500-mile-long “rabbit-proof fence”. Authorities take away Molly, Daisy and Gracie and relocate them to a children’s camp. Called the Moore River Native Settlement, this place is 1200 miles from home. In this strict environment, the kids must speak English and endure rough punishment for disobedience. One girl flees to be with her boyfriend; when caught, she’s isolated in a small box as discipline. Molly resists the pressures from those who run the establishment. Despite the solitary confinement that will occur if caught, Molly decides that she and her relatives need to make a run for it. The remainder of the movie follows the journey undertaken by Molly, Gracie and Daisy as they attempt to walk the 1200 miles back to Jigalong. We also see the attempts made by Neville to regain the kids. Fence provides a quietly powerful flick, and it works better than most because it lacks the expected mushiness. Much of the film’s strength comes from the performances of its young stars. Often child actors tend to mug and play cute, but that doesn’t occur here. The kids play their roles without a shred of sentimentality or sugary sweetness. Sampi offers especially positive work, as she makes Molly quietly tough and determined. The kids fill most of the movie’s screentime and really allow it to succeed. I also like the fact that Fence doesn’t tell its tale from the white man’s point of view. Too often, flicks that concern minority groups use their alleged subjects as secondary characters. From Dances With Wolves to Cry Freedom, it’s often hard to find such a movie that doesn’t stick us with the world via the white man. While Branagh’s Neville character presents the white perspective, he never even remotely becomes the film’s focal point. Because the DVD’s cover art prominently features Branagh, one might believe otherwise, but Neville remains a fairly minor participant. The kids remain the focus, which seems very appropriate. Although Fence definitely illustrates the fallacy of the Australian racial policies, it doesn’t hammer us over the head with its messages in that regard. I like that factor as well, for far too many of these movies come strictly from the contemporary viewpoint. Neville doesn’t come across as a sympathetic character, but although the kids refer to him as “devil”, the film doesn’t really paint him that way. Despite his cold appearance, it seems that Neville believes he acts in the best interests of the “ignorant” natives. The flick depicts him in a surprisingly unemotional and objective manner; most folks clearly will disagree with his ideas and actions, but at least the movie doesn’t show him as nothing more than a racist dolt. Rabbit-Proof Fence works because of its simplicity. The movie alludes to racial politics and other issues, at its heart it remains a tale of some very determined children who want to get home. The film never loses sight of that, so director Phillip Noyce keeps the story tightly focused and concise. This allows the strength of the tale to emerge without bias and creates a piece that seems effective and moving. 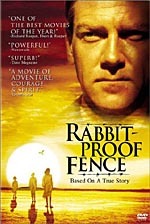 Rabbit-Proof Fence appears in an aspect ratio of approximately 2.35:1 on this single-sided, double-layered DVD; the image has been enhanced for 16X9 televisions. The movie seemed less well defined than I expected but generally looked good. Sharpness usually appeared positive, but those elements varied. Wide shots occasionally came across as somewhat indistinct, and some medium images also appeared a bit soft. Most of the movie remained adequately concise and accurate, however. I noticed no issues related to jagged edges or moiré effects, but some light edge enhancement cropped up at times. The movie showed a fair amount of grain on occasion, a factor that seemed to emanate from the original photography. Otherwise, the print appeared clean and lacked other defects. To match the harsh Australian environment, Fence featured a very arid and desaturated palette. Despite the lack of color, the image displayed appropriate and accurate tones. Occasionally slightly more vivid hues cropped up, but the movie largely stayed with tans and sandy colors, and the DVD showed these well. Black levels were generally acceptable but seemed a little inky at times, and shadows caused some concerns. Nighttime shots were somewhat thick at times, and the end of the film featured some rather dense imagery due to “day for night” photography. Rabbit-Proof Fence presented an adequate picture but it showed too many concerns to merit a grade above a “B-“. On the other hand, the Dolby Digital 5.1 soundtrack of Rabbit-Proof Fence succeeded quite well. The soundfield presented a surprisingly active and involving piece of work. For the most part, it tended toward a general sense of environment. Peter Gabriel’s score demonstrated fine stereo imaging, and different ambient elements filled the five speakers. The surrounds contributed solid support and even tossed out some stereo material at times. For example, one scene depicted the singing of the children. When the camera attitude changed, the vocals moved from the front toward the rear right speaker. 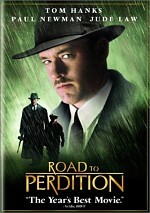 In general, however, the movie simply depicted the stark Australian setting, which led to a nicely engrossing feeling. Audio quality also came across well for the most part. Speech seemed concise and natural. I noticed no signs of edginess or problems related to intelligibility, as the lines appeared distinct at all times. Effects sounded natural and warm. They depicted good range and failed to display any signs of distortion. Unfortunately, a little roughness came through via the music, but that didn’t surprise me. I’ve heard enough from Peter Gabriel to know that the distortion likely emanated from his original work, and those issues remained minor. The score usually sounded dynamic and warm, and the entire track displayed fine bass response. Overall, the audio of Rabbit-Proof Fence worked well and suited the film nicely. A few supplements pop up on Rabbit-Proof Fence. We start with an audio commentary from director Phillip Noyce, featuring musician Peter Gabriel, actor Kenneth Branagh, screenwriter Christine Olsen and author Doris Pilkington. What does “featuring” mean? This connotes that we find an edited piece that mostly features Noyce; the others pop up from time to time, but he presents the most consistent presence. The two writers appear early in the commentary, whereas Gabriel and Branagh show up midway through the flick. All four offer some insightful notes about their work; in particular, the two women give us useful material. However, this remains Noyce’s track at its core. Noyce actually provides a screen-specific affair. Since he refers to the screen only once that I noticed, that issue doesn’t play a factor. Not that it matters, for Noyce gives us a splendid look at the film. He covers his involvement in it and he frankly expresses his problems with the Hollywood system as he details why he didn’t direct The Sum of All Fears. He provides historical background for the topics discussed in the flick and gets into matters related to casting, photography, locations and other technical concerns. Noyce gives us a nice level of introspection and honesty, and he makes this a very effective and informative commentary. Next we locate a documentary called Following the Rabbit-Proof Fence documentary. This program lasts 42 minutes and 50 seconds and mixes lots of behind the scenes footage with a few movie snippets and interview clips from director Noyce, drama coach Rachael Maza, and actors Kenneth Branagh and Ningali Lawford. While the latter two elements help expand on the subject, the raw video footage from the production makes “Following” a keeper. We focus on the casting process and the work done with the young actors who played the leads. We see how they were selected and how the actor originally cast as Daisy got the boot. We also observe the volatile personality of Everlyn Sampi and how this endangered the success of the shoot. The program seems frank and compelling as it covers the most intriguing aspect of Fence in a thorough and direct manner. It’s an excellent documentary that definitely merits a screening. Lastly, the DVD includes a Sneak Peeks. In addition to a general promo entitled “Miramax Year of Gold”, we get ads for Frida, Noyce’s Quiet American, and (Kieslowski’s) Heaven. No trailer for Fence itself appears. When I went into Rabbit-Proof Fence, I knew literally nothing about the film. I found an engrossing and gently moving and strong story that worked because of its lack of excessive sentimentality. The DVD presented erratic but adequate picture along with surprisingly good audio and a small but terrific roster of supplements. A surprisingly effective and compelling film, Rabbit-Proof Fence comes with my strong recommendation.